For many decades, events like birthday parties, wedding, team-building, business summits, and Christmas celebrations have been associated with pretty standard menus reminiscent of what we see in the best hotels, restaurants, and other food points. These menus are specially designed, and different recipes are used to prepare the foods. Take a wedding event for instance: the standard menu would be salad first, then chicken, fish, beef, or any other entrée- and the wedding cake would follow. The business of serving such menus to guests at events is known as catering, and it is one of the most popular and successful business ideas today since its inception in the 18th century. 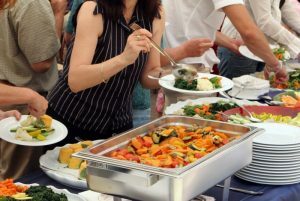 Catering helps in the provision of food to events, parties, and institutions. Caterers can serve any number of guests with meals in a single hall, or they can deliver box lunches to guests at a small business conference. Caterers usually try to meet the needs of their clients in a variety of ways. Meal adjustments may be necessary to ensure that a menu suits a given event. Typically, catering firms send their chefs and servers to the site of the event. The extent of catering service and type of food served may depend on the nature and size of the event. For instance, if you’re hosting a small birthday or office party, beverages, cold food, and furniture rental may just be enough for the event. In this case, catering employees may not be required to be on the site. On the other hand, high-profile events such as conventions and summits may require comprehensive catering services that include breakfast, lunch, and dinner. Catering does not just stop at food preparation and serving- it also involves renting out equipment, such as popcorn makers, refrigeration units, and utensils for events. The business also entails venue setup. Now that you understand what catering is all about, go ahead and treat your guests.